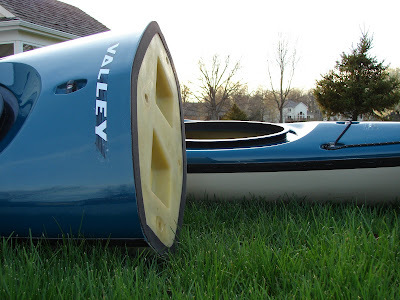 So, this boat is 6 inches longer than the Aqunaut LV, and has compass and built-in pump, and weighs about 12 lbs more. The carbon Kevlar Premium hull (not deck) layup alone of the Aquanaut LV was said to gain about 8-9 lbs of saved weight, and that would appear to be the case. What is interesting is that the "cuts" of the two boats are very different. The 2002 Argonaut has a light and small bow and stern and the rear section division is behind the day hatch. The 2008 Aquanuat LV has the rear division in front of the day hatch, thus adding weight to the stern piece and taking weight off the already heavy center piece. I like the new styling better. I will post on another day about the differences in the skeg designs betwen the two boats and how that comes into play with the types of sections. For now, it's safe to say that this boat is heavy, but very rugged with double bulkheads. I will paddle it proudly and know that, like the on-deck batter swinging a weighted bat, when I step into one of my single piece rotomolded kayaks it'll feel like I'm paddling a carbon Epic. I really like your blog. I really appreciate the good quality content you are posting here for free. I was looking to buy an inflatable boat foot pump but was looking for all the characteristics. Thanks for sharing all the information with us.